Saturday April 7th 1883. I was busy all the forenoon cleaning up the house. Mrs Day came just before noon. I went to town in the afternoon to get some things and was at Hatts awhile. I found her doing her own work, her girl having gone home sick. I came on home before supper. Mrs Day spent the evening with us. 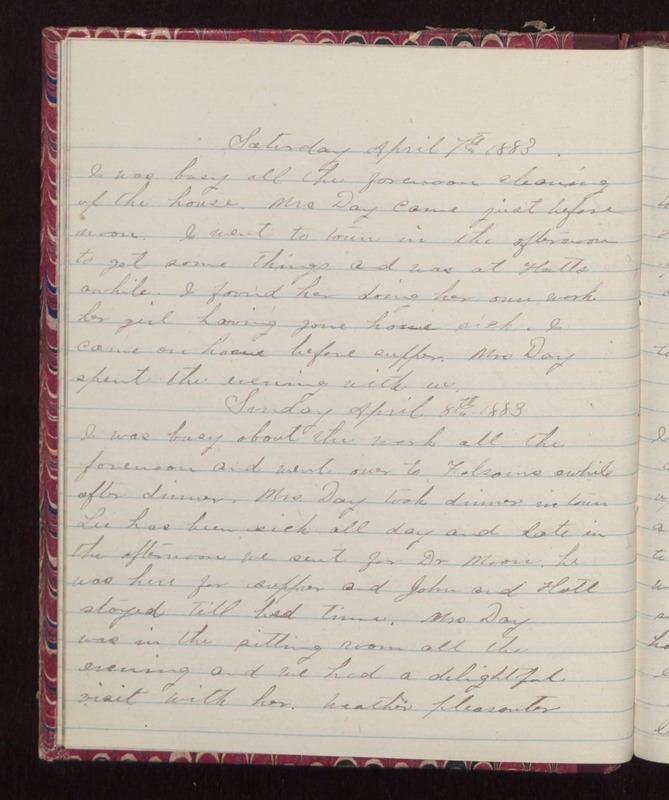 Sunday April 8th 1883 I was busy about the work all the forenoon and went over to Folsoms awhile after dinner. Mrs Day took dinner in town Lee has been sick all day and late in the afternoon we sent for Dr Moon, he was here for supper and John and Hatt stayed till bed time. Mrs Day was in the sitting room all the evening and we had a delightful visit with her. Weather pleasanter.